Stations of the Cross (or Way of the Cross; in Latin, Via Crucis; also called the Via Dolorosa or Way of Sorrows, or simply, The Way) refers to the depiction of the final hours (or Passion) of Jesus, and the devotion commemorating the Passion. The tradition as chapel devotion began with St. Francis of Assisi and extended throughout the Roman Catholic Church in the medieval period. It may be done at any time, but is most commonly done during the Season of Lent, especially on Good Friday and on Friday evenings during Lent. The Stations of the Cross originated in pilgrimages to Jerusalem. A desire to reproduce the holy places in other lands seems to have manifested itself at quite an early date. At the monastery of Santo Stefano at Bologna a group of connected chapels was constructed as early as the 5th century, by St. Petronius, Bishop of Bologna, which was intended to represent the more important shrines of Jerusalem. The devotion of the Via Dolorosa, for which there have been a number of variant routes in Jerusalem, was probably developed by the Franciscans after they were granted administration of the Christian holy places in Jerusalem in 1342. The earliest use of the word “stations,” as applied to the accustomed halting-places in the Via Sacra at Jerusalem, occurs in the narrative of an English pilgrim, William Wey, who visited the Holy Land in the mid-15th century, and described pilgrims following the footsteps of Christ to the cross. In 1521 a book called Geystlich Strass was printed with illustrations of the stations in the Holy Land. During the 15th and 16th centuries the Franciscans began to build a series of outdoor shrines in Europe to duplicate their counterparts in the Holy Land. The number of stations varied between eleven and thirty. 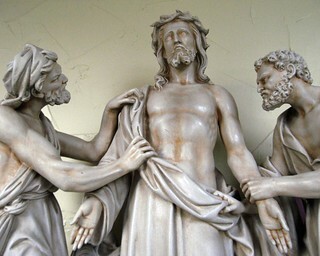 The object of the Stations is to help the faithful to make a spiritual pilgrimage of prayer, through meditating upon the chief scenes of Christ's sufferings and death. It has become one of the most popular devotions for Roman Catholics. In the Roman Catholic tradition, the meditation is often performed in a spirit of reparation for the sufferings and insults that Jesus endured during His Passion. Our Lady of the Holy Spirit Center is located in the heart of Greater Cincinnati and sits on 13.1 acres of landscaped property in a residential area of Norwood, Ohio. This structure, originally built in 1920 under the direction of Archbishop Henry Moeller as a major seminary, has now become a Marian center.